If you've known me during the fall, you know that I love pumpkin. I'll take it in my pancakes, coffee, chili, pies, and, most importantly, beer. Like this one, which took me 3 full years to find in DC. There are two types of pumpkin to cook with - canned or fresh. For canned pumpkin, I broke down and bought an enormous pack from Costco. For fresh pumpkin, you simply bake a sugar/pie pumpkin and scoop out the flesh (more detailed instructions in this post). You can then freeze it in 1-cup increments in small freezer bags to pull out whenever you need it. This year, pumpkin picking just hasn't been in the cards, so it's been canned pumpkin all the way. Which makes it very easy to whip up a quick batch of pumpkin walnut muffins on a work night. They make your kitchen smell like fall and are wonderful fresh or grilled in the morning. I even had to give some away to friends so that I wouldn't eat them all myself. To start, melt the butter in a small bowl in the microwave and let it cool. Completely forget to take a picture of it. Next, prepare the walnuts by chopping them finely on a cutting board. I made the mistake of not chopping them finely enough, which caused some of the larger pieces to burn in the oven. I recommend chopping them quite coarsely. Set them aside for later. Now mix all of the dry ingredients together in a large bowl. 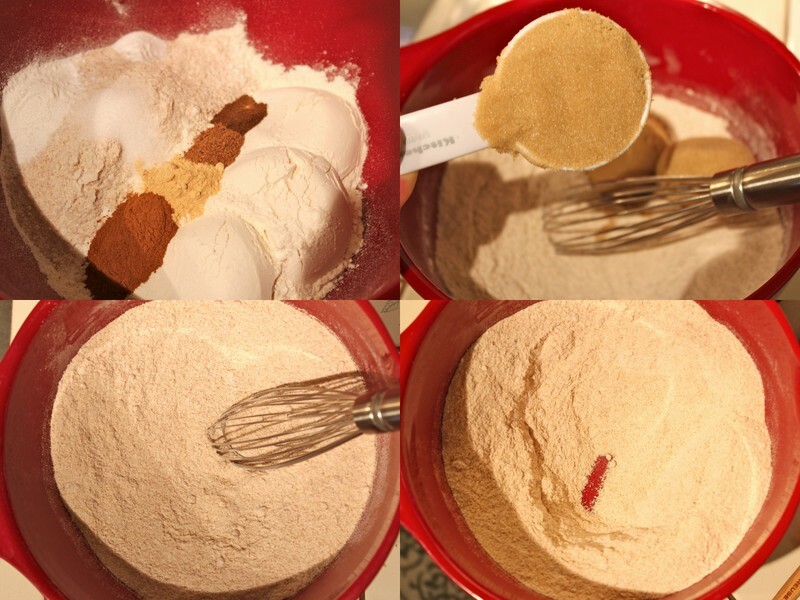 About the flour: The recipe calls for 1 cup white and 1 cup white whole wheat flour. I used 1 cup white, 3/4 cup whole wheat, and 1/4 cup wheat germ. The recipe is pretty forgiving, so use whichever flour you prefer (or whatever you have on hand). Now mix all the wet ingredients together, including the cooled butter. This is why it's important to let it cool - you don't want hot butter mixed in with the egg. Make a well in the center of the dry ingredients and pour all of the wet ingredients in, mixing well. If you're using raisins or chopped dates, now would be the time to fold them in. I didn't have any on hand, so I skipped them, but I think they would add a great sweetness and extra moisture. You can't go wrong either way, though. Next you're going to prepare the muffin tin. Here you have a few choices - a muffin tin lined with cupcake papers or sprayed with cooking spray, or silicone baking cups. I used silicone baking cups and sprayed them with cooking spray. These little guys are the greatest - they're super cute, the muffins pop right out of them after they're cooked, and they're reusable. 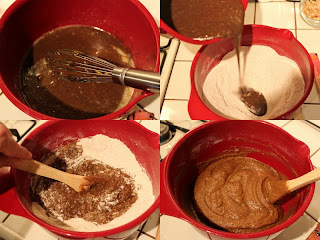 Using a large spoon, drop enough batter into each cup to fill it almost to the top. Bake them in a 400 degree oven for 20-25 minutes. You'll know they're done when you insert a toothpick into the center and it comes out without any batter stuck to it. Let them cool for a few minutes, then transfer them to a rack to cool even more. You can serve them right away when they're still warm, or they'll keep for several days in an airtight container. You could probably wrap them well and freeze them, but I can't attest to the success of this method. They're best enjoyed with a hot cup of coffee or a cold glass of milk. Happy fall! Preheat oven to 400 degrees. In a small bowl, melt the butter and set aside to cool. In a large bowl, mix together the flours, baking powder, cinnamon, ginger, cloves, nutmeg, salt, baking soda, and brown sugar. In a smaller bowl, mix together the butter, pumpkin, milk, eggs, molasses, and vanilla. Make a well in the dry ingredients and pour the wet ingredients in. Mix until well incorporated, then fold in the dates. Prepare muffin tins using paper liners or cooking spray. Drop spoonfuls of batter into each cup to fill them approximately 3/4 high. Sprinkle walnuts over the batter, pressing them in so that they stick. Bake at 400 degrees for 20-25 minutes or until a toothpick inserted in the center of a muffin comes out clean. Cool for several minutes before removing from the muffin tin.